The NEW GEC MD600L mechanical wheel-load scales are light weight, low-height and the most durable wheel scale of its type in the world. The MD600L is an improved engineering design based on 60 years of proven field performance of GEC’s MD400’s and MD500’s. 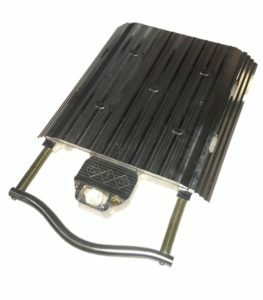 The MD600L has a 19-1/4″x 14-1/4″ “active” platform area, 1.8″ in height, weighs 46 pounds and can accurately weigh on any multi-terrain surface. The 600L can be used in most any environment or weather conditions for law enforcement or commercial applications. The MD600L is accurate to +/-1% and easily read with a magnified lens in pounds or kilograms. The MD600L is built for extreme conditions and is intrinsically safe. The WMS is our newest portable electronic heavy duty wheel weigher. This rugged, portable hand-held unit weighs on 40 lbs. It’s fully electronic design and improved features, communicates through a secure wireless network. Typically used in sets of 2, 4, and 6. Scales use an LCD display and powered by commercially available disposable or rechargeable batteries. 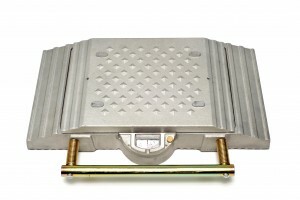 These vehicle weighing systems are also capable of recording accurate weights on uneven surfaces and in harsh conditions. The MD500E is a single portable electronic wheel-load weigher. The MD500E includes each of the advantageous qualities encompassed by the MD400E. In addition, the MD500E is three inches greater in width, ensuring an accurate measurement of a dual wheel configuration. These scales can be configured with wireless features. 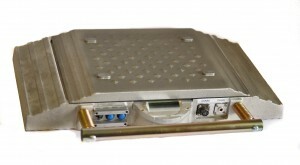 The MD400E is a single portable electronic wheel-load weigher. 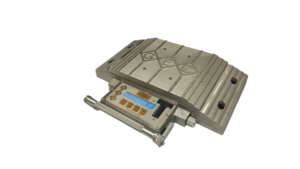 Each scale can be configured to be a multiple scale weighing system. Each scale is cabled together with a local total feature which allows summing of all scales into any single scale in series. They are used in sets of 2, 4, and 6. It uses an LCD display and powered by commercially available disposable or rechargeable batteries. The Truck Weighing Systems are also capable of recording accurate weights on uneven surfaces and in harsh conditions. These scales can be configured with wireless features. The MD500 includes each of the advantageous qualities encompassed by the MD400. In addition, the MD500 is three inches greater in width, further ensuring an accurate measurement of dual wheel configurations. The MD400 is a portable, fully-mechanical wheel-load scale that is ideal for quick weighing on any surface. The lightweight unit makes it easy to transport to multiple sites. It’s designed specifically for rough and harsh environments. There is no temperature or environment too extreme for these scales. Each unit is intrinsically safe and fully self-contained.